“Peach festival”, one of the representative festival in Koga. let a farmer bring up a peach in early period of Edo era. Because the firewood which became the fuel was poor in the territory, it was fast-growing, and the peach that fruit became the food seemed to be chosen. The present peach is planted peach to commemorate opening Koga Sogo Park to view them. 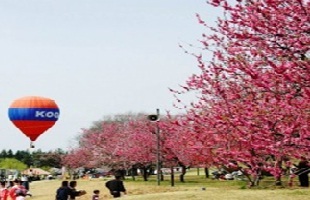 Approximately 1,500 trees of 5 varieties of peach flower in full bloom in the park from March 19, Saturday to April 5, Tuesday in this year, too. 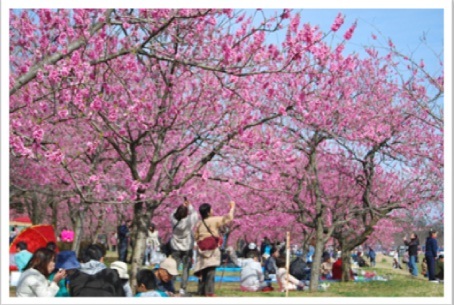 You can enjoy beautiful peach flowers and some events! Some events, Nodate – chakai (open-air tea ceremony), stalls, stage event etc. are held at the park. Also. Koga Momo Musume (tourism ambassador who wearing kimono) greet you at the park. On Saturdays, Sundays, and holidays during the period, there is hot-air balloon experience-based boarding. Tie up a balloon with a rope; go to an altitude of 20-30 meters above the ground! The scenery looking at a flower peach in full glory from the ground is great too. ※It is called off in a strong wind, the rainy day. The rate is adult (more than a junior high student) 1,000 yen, child (primary schoolchild) 500 yen. They accept you on that day in the field. Most of the peach flowers in the park are Yaguchi. Kurokawa Yaguchi blooms among them. You can see Genpei towards the northwest, Kiku-momo and Kanpaku towards the north, Jusei-to in the east in the park. Peach flowers of 5 kinds are in full bloom, colored with them in the park. Its scenery is just looks like the Earthly Paradise. Why don’t you walk wonderful another world? Shuttle bus is available in the period. Copyright © 2010 Ibaraki-Prefectural Tourism & Local Products Association All rights reserved.